We take a look at this great tool created by the team at Elastic to help benchmark the performance of your Elasticsearch clusters. If you rely on Elasticsearch for centralized logging, you cannot afford to experience performance issues. Slow queries, or worse, cluster downtime, is not an option. Your Elasticsearch cluster needs to be optimized to deliver fast results. The problem is that optimizing Elasticsearch for performance is one of the major challenges facing any team running Elasticsearch at scale. There are so many factors to take into consideration — cluster size, node roles, the number of indices, and shard size to name a few. While there are no official rule-of-thumb recommendations for most of these variables, one best practice is to continuously test and benchmark the performance of your cluster. In a previous article, we wrote about a simple Dockerized benchmarking tool we use to test our Elasticsearch clusters, but in this article, I’d like to cover Rally — a benchmarking tool developed by the folks at Elastic that is a bit more complex and covers a wide range of use cases and configurations. 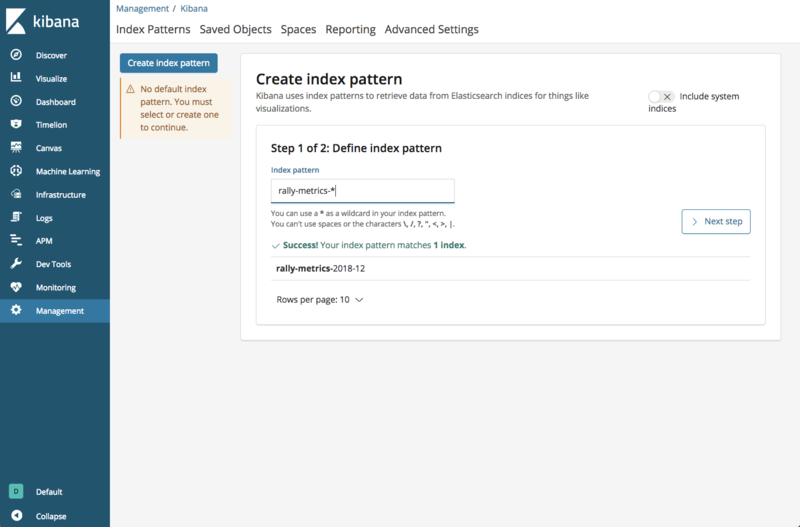 Initially announced back in 2016, Rally 1.0 was only released in July 2018 and is the benchmarking tool used by the Elasticsearch development team to run their nightly benchmarking tests. The beauty about Rally is that it can act not only as a load generator but it can also build, set up, and tear down Elasticsearch clusters for you which helps you test in a vanilla environment. You can use Rally to benchmark against an existing Elasticsearch cluster, manage benchmark configurations, run and compare results, and find potential performance issues using what are called telemetry devices (e.g. JIT, GC, perf). The required steps for installing Rally depend on how you intend to conduct your benchmarking — against an existing Elasticsearch cluster or against a vanilla cluster that will be provisioned as part of the test. The steps below include all the prerequisites needed for the latter scenario. In any case, I recommend referring to Rally’s documentation before you start for different instructions per OS and scenario. Before you run Rally, it needs to be configured. Configuration successfully written to /home/ubuntu/.rally/rally.ini. Happy benchmarking! You should see a list of track names and descriptions, together with the size of the data (compressed and uncompressed) and available challenges you can run. Race – a benchmarking experiment. Track – a benchmarking scenario. So you will be running a race using a track. Rally will commence the test by first downloading the Elasticsearch version you defined and the relevant data. It will then run the actual benchmark and report the results. It will take quite a while, so be patient. The report Rally provides is extremely detailed. 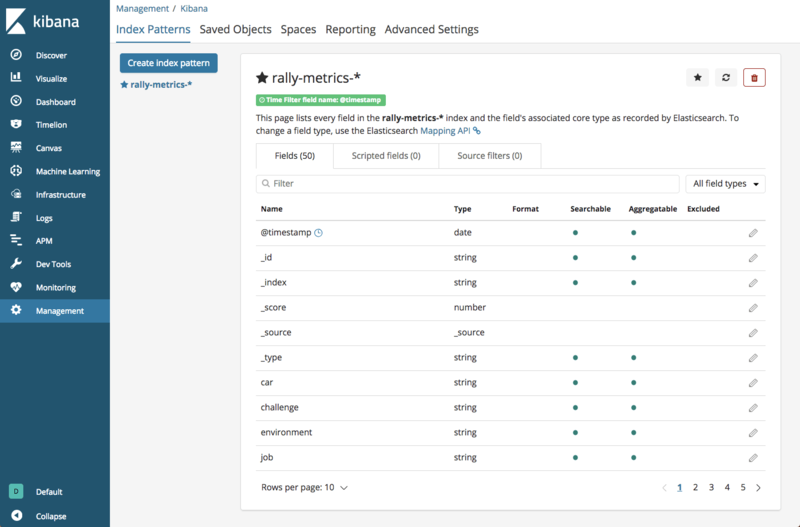 You can take a look at all the different metrics made available and what they mean in Rally’s documentation. 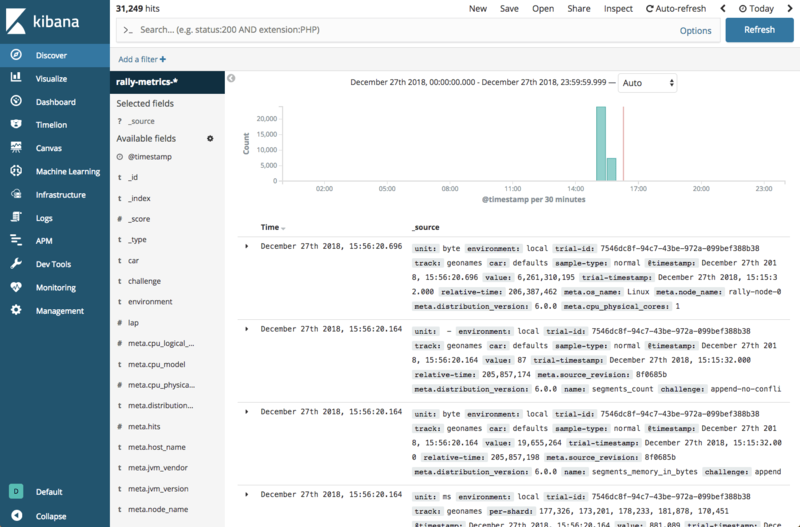 As I mentioned above, Rally supports a variety of advanced configurations, including the ability to store benchmark metrics in an Elasticsearch index for analysis in Kibana. To use this option, you will, of course, need a separate Elasticsearch and Kibana deployment. A series of configuration settings are displayed. Just run with the default settings, but for Metrics store type, enter 2 for storing on Elasticsearch and then provide connections settings as requested — your Elasticsearch hostname (default is localhost) and port and authentication details if you’re using X-Pack. I just touched the surface of what Rally can do. I ran Rally using one of the provided tracks and a provisioned Elasticsearch cluster, but you can create your own customized tracks, test against remote Elasticsearch clusters, and create tournaments (comparing races for measuring performance improvements). Rally is not easy to handle and requires a good understanding of the ins and outs of Elasticsearch performance metrics, but the information Rally provides gives you a good understanding of how Elasticsearch is performing under different loads and what is required for optimization. Before using Rally on your own Elasticsearch clusters, use the instructions here to play around with the tool and become familiar with its operation. Once you feel you’ve gained familiarity with Rally, run it in a sandboxed environment. In any case, do not run Rally against production clusters.